About the Book: Ever is now an immortal, and she’s eager to learn everything - from manifesting objects to visiting the paradise Summerland. Things are looking up for Ever and Damen, who can finally be together. But just as Ever finds her power’s growing, Damen’s starts to fade. He’s becoming weak and he’s even starting to forget Ever. Ever travels to Summerland to save Damen, but while there she discovers she might be able to save her family. Ever must choose which path she’ll take and who she’ll end up saving. GreenBeanTeenQueen Says: There is so much going on in this book that I don't want to say in the summary because I don't want to ruin it for you. All I can say is read this book! There were numerous twists that kept me guessing. Just when I thought I had things figured out, I would get pulled in a new direction, which kept the book fast-paced and full of suspense - I had to keep turning the pages. There is a lot more focus on Ever and her growing powers and we also get to find more about Damen's past, which I enjoyed. I really liked the addition of Roman and the twins Romy and Rayne that Ever meets in Summerland. They added to the story but still have a lot of mystery surrounding them, so I’m eager to see how the many stories that were weaved together in Blue Moon will play out. OMG your review makes me want the book more! I am SO jealous of you. 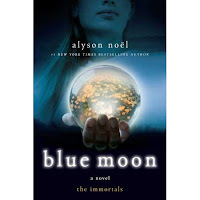 I'm dying to read Blue Moon. I can't wait for the the 7th! It looks sooo good! Kate-Let me know what you think of it when you read it-I'm eager to talk to people about it. Debbie-I know, I hate waiting too and this one has a pretty annoying cliffhanger! Erica-I hope you get to read it-it was very good! Ooooh, this makes me want to read Evermore even more!!!! God i really can't wait to read this book! I haven't even read Evermore yet, but im just itching to buy them already! I love your blog! I'm so jealous that you've read this already! I can't wait to nab a copy, I think I have a hold on it at the library - hopefully they'll give it to me early ;). Evermore was SO good, and you make Blue Moon sound even better! Fortunately we only have to wait a few more days for this one to be released. Sounds awesome. I can't wait to read Evermore. I didn't love it at all. I linked to your review on my review post.